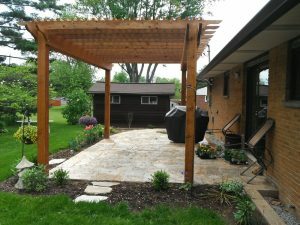 Arbors, pergolas, pavilions and trellises add vertical beauty, enclose a space for privacy, define an entryway, provide shade and add character to your landscape. Our wide variety of custom outdoor structures can make the outdoors an inviting, relaxing place to spend time with friends and family during the summer heat. Dean’s Landscaping offers custom built outdoor structures tailored to your individual landscape project. Whether you prefer vinyl, white pine or cedar we have a solution for your outdoor project.